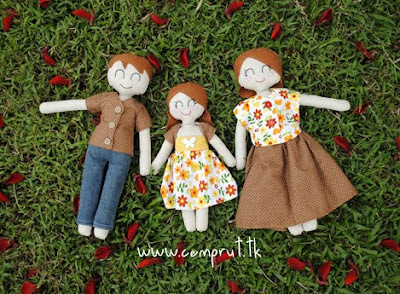 c e m p r u t: the Diba's family dolls...!!! Diba's Mom asked me to make a family dolls, Ayah, Diba and Bunda Ann. i just can wait to make it so i start to make it before i know the pic of the rest family, so this is the doll result. but when Mom Ann wants to change the hair color, so ur wish is my command Mom. not only the hair color but i change the hair model too, hope u like it... so if u wanna make a family doll with ur customize outfit, just email me... and oh, all pic took by Ay, thanks dear... come visit his photo blog in HERE !! !